We live in a world of snaps, texts and tweets. Yet despite our reliance on technology for real-time updates, the greeting card industry continues to grow. In fact, the Greeting Card Association (GCA) estimates annual sales of greeting cards to be between $7-8 billion. Not million. BILLION. And, if you think Facebook birthday wishes posts have replaced birthday cards, the most popular everyday card-sending occasion, you’d be wrong. GCA notes that while most people now acknowledge many more birthdays than ever before because of Facebook, they’re not necessarily sending fewer cards as a result. Whether as an add-on with gift purchases or a destination display, greeting card and stationery sales can add up for retailers. And since there are a wide range of options for customers these days, focus on quality, something customers are willing to pay for when it comes to greeting cards and stationery. Why not be a one-stop shop and provides a whole gifting experience for the customer? While birthday cards tend to see the most traffic, don’t miss opportunities to promote everyday cards by placing them near other merchandise. For example, have a card with a tea cup on the cover? Place it next to a display with a tea kettle, tea cups, tea. Add a table tent that might recommend the customer reach out to ask someone to enjoy a cup of tea with them. Go through the shop and think of places where an everyday card might work well with the display. Frame some of your cards. Some cards really are worth framing and I’ve been known to buy cards just to frame them. Showcase them as wall art and encourage customers to think about them as frame-able gifts, too. Quirky “celebrations” make for good social media & merchandising ideas. Want to encourage customers to celebrate National Vegan Day (coming up, by the way, November 1st!)? Display cards with beautiful images of fruits, vegetables or farmland. February 7 is National Send a Card to a Friend Day and June 7 is Drawing/Pencil Day. Craft relevant displays and add your cards to the mix! Encourage kids to get involved by hosting a “make your own greeting card” event in the shop. Use your greeting cards as inspiration. Partner with a non-profit and send the cards to the organization (think hospitals, veterans, soldiers currently serving, the elderly, etc). Ask your customers for their birthday (you don’t need the year!). Make sure to send them a birthday card without a sales pitch. Host an origami contest with beautiful paper you collect throughout the year. Post the participant’s pieces on a social media page and encourage your customers to choose the winner. The winner can then choose from your beautiful selection of greeting cards a week later. While greeting cards are always lovely, don’t forget stationery. Nicely appointed notepaper, writing sheets with interesting textures and unique pens hold a special place in my heart and I bet in many of your customer’s hearts, too. I’ve given them as housewarming gifts (complete with a book of stamps! ), host/hostess gifts and even to clients and bosses. As the holidays are approaching, consider crafting a display completely around stationery. Journaling is still a thing even though some people think it’s gone the way of dinosaurs. For many, it’s an important part of their day, for others, it’s meditative. Yet others use it for doodling. Whatever their reasons, customers still love journals. Don’t hide them. If you blog or are active on social media, call them out as a great way to relieve stress or share an article about the positive effects of journaling and let your customers know you have an assortment from which to choose. Create a media-worthy event to get publicity. How about hosting your city’s largest “write in” and encourage your customers to write thank you notes to someone special (perhaps their favorite teacher?). Set up seats and tables in front of your store to create a photo opportunity. Encourage kids to be part of it. Invite an instructor to teach a class on calligraphy or journaling. Charge a nominal fee and give every attendee a greeting card with a coupon to redeem another card at a discount over the next two weeks (so they need to return sooner than later). 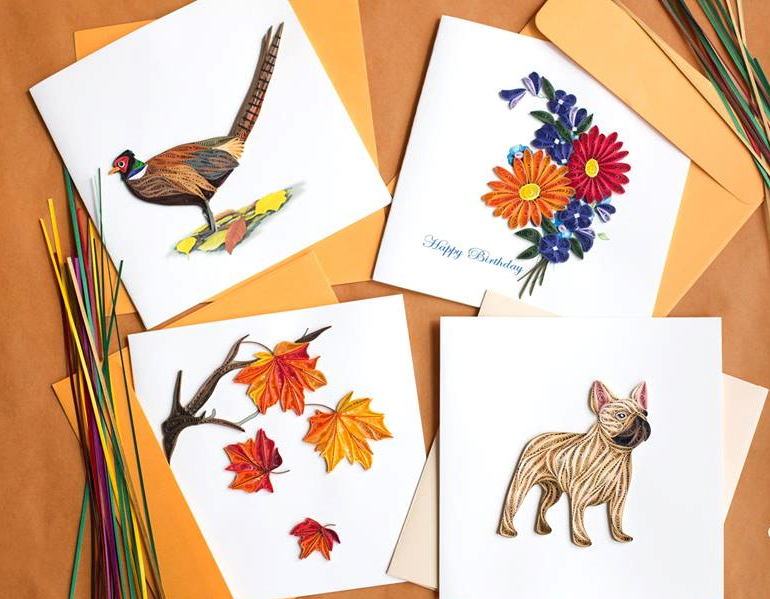 Greeting cards aren’t just for birthdays and while your shop may not be known for its card selection, you want customers to know you do offer them if you have them available. The obvious tactic of asking a customer if they’re looking for a gift while they’re shopping opens up the dialogue to asking if they’ll need a card, too, but sometimes we just want an opportunity to send a card. Your selection of greeting cards and stationery should represent what your shop is about. Use it as another way to connect with your customers on a personal level. The variety of high-quality greeting cards, journals, and stationery available from Fair Trade Federation wholesalers is astounding. The materials can be anything from handmade paper from cotton to elephant dung. If you don’t already carry stationery products in your store, you may want to try some from these FTF wholesale members or visit Global Crafts’ showcase. 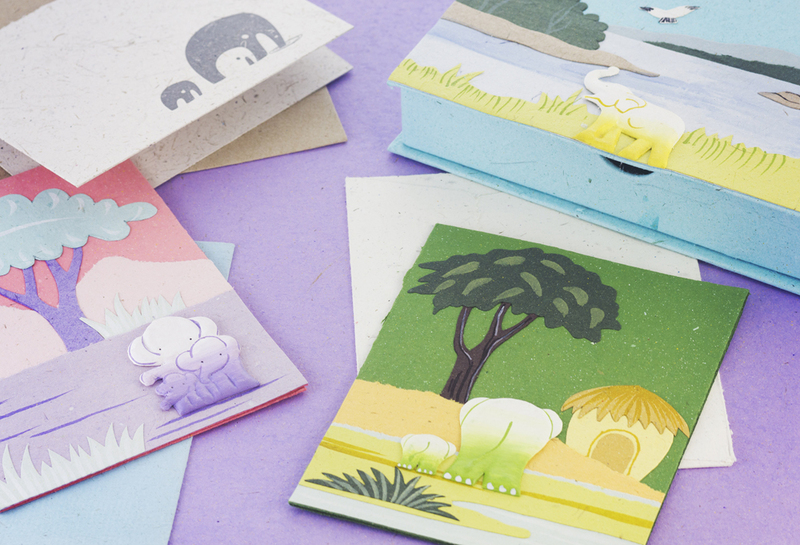 Working with artisans in the Philippines and Rwanda, Good Paper has incredibly clever fair trade greeting cards, many of which have great groan-worthy puns. Pictures don’t do justice to the greeting cards from Quilling Card. The images on the cards are made by artisans in Vietnam who roll strips of colored paper (they’re on the edges of the picture) and painstakingly glued them to the card. I loved reading this article because these were some ideas I’ve already considered relating to promoting the sale of greeting cards. Great minds think alike! Thank you.